Last year marked 50 years of Israeli military occupation, with no signs of abatement in Palestinian children’s vulnerability to injury and abusive military arrest in the West Bank. Rapidly devolving living conditions in the Gaza Strip put in jeopardy the most basic human rights, as children became collateral damage in an internal Palestinian political standoff. Israeli forces’ misuse of crowd control weapons caused critical and permanent injuries to some children while others endured ill-treatment amid high rates of military detention. An electricity crisis in the Gaza Strip led to the most severe downturn in the ongoing humanitarian crisis since Israel imposed a military blockade a decade ago, with hefty repercussions to children’s rights to clean water and health. Israeli forces killed 14 children in the Occupied Palestinian Territory (OPT) during 2017, according to Defense for Children International – Palestine documentation. In addition, nine-year-old Mohammad Abu Hdaf died on December 6 due to injuries sustained during an Israeli drone strike in the Gaza Strip in 2014. Five children were killed by live ammunition during clashes between Palestinians and Israeli forces in the West Bank, including East Jerusalem, and the Gaza Strip. Five more children accused of committing some kind of attack also sustained fatal gunshot wounds. Israeli forces shot four Palestinian teenager inside a car on March 23 during unclear circumstances near the Israeli settlement of Bet El, north of the West Bank city of Ramallah. Mohammad Khattab, 17, died on the spot, and Jasem Nakhleh, 16, succumbed to his wounds 18 days later. The two others sustained serious injuries, but survived. An Israeli military statement confirmed “hits,” according to local media, but claimed that the children were shot outside their car, while throwing explosives toward the settlement. Under the condition of anonymity, a witness told DCIP that Mohammad was shot when he got out of his stalled car near Bet El settlement, to push it. Mohammad jumped back into the car to try to escape, but the car did not start, according to DCIP’s source. The witness said Israeli soldiers then approached the car and opened fire on all four children. The United Nations Office for the Coordination of Humanitarian Affairs (OCHA) reported at least 961 child injuries at the hands of Israeli forces between in 2017. At the time of publication, DCIP had documented 61 child injuries by Israeli forces from a mix of live ammunition, rubber-coated metal bullets, and crowd control weapons in the West Bank, including East Jerusalem, and 28 in the Gaza Strip in 2017. Of these cases, 33 children sustained injuries to the upper body from crowd control weapons, in some cases causing irreversible damage. Crowd control weapons are only “less lethal” when fired at the lower body, from a distance of 50 to 60 meters (164 to 197 feet) and not aimed at children, as stipulated by Israel’s own military regulations. Israeli forces shot at least two children in the face with rubber-coated metal bullets and two children in the head with tear gas canisters during a two-week period in December alone. An Israeli soldier on December 15 shot Mohammad Tamimi, 15, in the face at close range with a rubber-coated steel bullet in the West Bank town of Nabi Saleh. The bullet lodged in the back of his skull and caused severe bleeding in his brain. Days before, 14-year-old Mohammad al-Farani was hit in the face with a tear gas canister shot by Israeli forces from a military watchtower 50 meters (55 yards) away on the border between the Gaza Strip and Israel. He suffered a fractured cheekbone, head gash, internal bleeding in the brain, and permanent loss of his right eye. The injuries took place as Israeli authorities used excessive force to quash widespread protests that erupted across the OPT following the United States’ recognition of Jerusalem as Israel’s capital on December 6. Heightened violence was ongoing as the year came to a close. Evidence collected by DCIP also showed that Palestinian children in East Jerusalem were particularly vulnerable to misuse of black sponge-tipped plastic bullets by Israeli forces. Jerusalem residents Nour al-Din Mustafa, 13, and Tareq Mohammad, 15, suffered permanent eye loss after being hit with black sponge-tipped plastic bullets. Neither children was involved in confrontations at the time of injury. Accountability is extremely rare in cases where Israeli forces are accused of committing crimes against Palestinian children. Israeli rights group Yesh Dinreported that of 186 internal investigations into Israeli soldiers accused of harming Palestinians in 2015, only 3.1 percent of cases yielded an indictment. Among Palestinian children killed by Israeli forces in recent years, only one incident, the fatal shooting of Nadeem Nawara, 17, in May 2014, has resulted in both an investigation and indictment. Between February and November, an average of 310 Palestinian children were in the Israeli prison system each month for “security offences,” according to Israel Prison Service (IPS) data. Among them were an average of 60 children between the ages of 12 and 15. The IPS does not release the yearly total number of incarcerated Palestinian children and has stopped consistently releasing monthly data since May 2016. Israel has the dubious distinction of being the only country in the world that systematically prosecutes an estimated 500 to 700 children each year in military courts lacking fundamental fair trial rights. Children within the Israeli military system commonly report physical and verbal abuse from the moment of their arrest, and coercion and threats during interrogations. 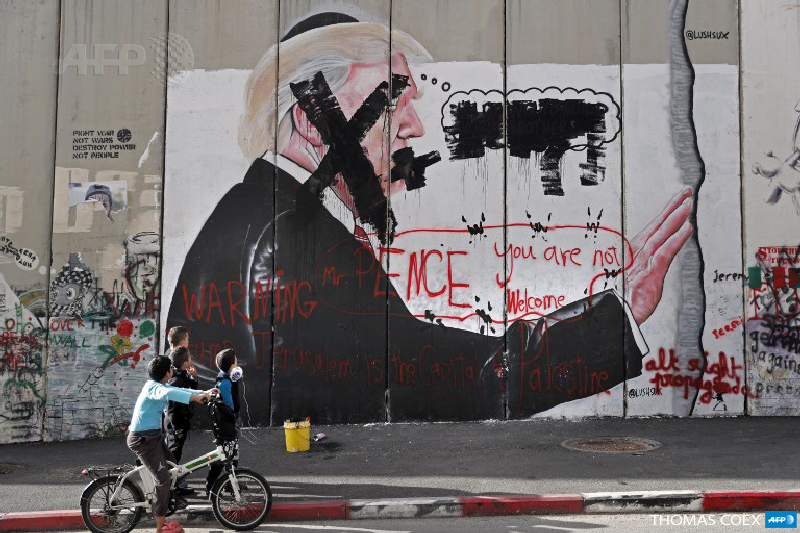 Large-scale demonstrations, marches and clashes throughout the West Bank following U.S. President Donald Trump’s decision to publicly recognize Jerusalem as Israel’s capital in December corresponded with a spike in the number of Palestinian child detainees. Louay al-Mansi, a Palestinian prisoner in charge of juveniles at Israel’s Ofer military prison, told DCIP that some 78 children arrived in December, more than doubling the number of child detainees to be newly incarcerated in the military facility from the month before. Among those held in Ofer was 16-year-old Fawzi J., detained in the southern West Bank city of Hebron on December 7. He told DCIP lawyer Farah Bayadsi that by the time he arrived to interrogation, one of his shoes had been kicked off and he had been repeatedly beaten and verbally abused for nearly two hours. Fawzi told DCIP lawyer Farah Bayadsi of the extreme pain in his right shoulder, prompting her to demand a medical check-up on December 25 that confirmed a fractured shoulder sustained during his arrest. Late on December 27, Fawzi was released on 10,000 shekels (around US$2,900) bail and a third-party bond in the same amount. DCIP filed a complaint over his ill-treatment while in Israeli military detention. DCIP collected affidavits from 137 West Bank children detained and prosecuted under the jurisdiction of Israeli military courts in 2017. The data shows that 74.5 percent of children endured some form of physical violence following arrest and 62 percent were verbally abused, intimidated, or humiliated. Of the 137 children, 26 were held in solitary confinement for interrogation purposes for an average period of 12 days. The longest period of isolation for a child that DCIP documented in 2017 was 23 days. At least five Palestinian minors were placed in administrative detention in 2017, a form of imprisonment based on secret evidence without charge or trial. Of these, three were released without charge after a period of two to seven months, leaving two still in administrative detention at year’s end. Another teenager placed under administrative detention in August 2016 when 17 years old, spent his 18th month in prison without charge or trial. Israel has placed a total of 25 Palestinian minors in administrative detentionsince October 2015 when it renewed the practice against individuals under the age of 18.
International juvenile justice standards, which Israel has obliged itself to implement by ratifying the UN Convention on the Rights of the Child (CRC) in 1991, demand that children should not be deprived of their liberty unlawfully or arbitrarily. The arrest, detention or imprisonment of a child shall be used only as a measure of last resort and for the shortest appropriate period of time. Palestinian security forces in the West Bank exhibited patterns of abuse against Palestinian children detained in 2017. DCIP investigation into child detentions by Palestinian security forces showed they carried out arbitrary detentions through a non-transparent process rife with rights violations, including the use of solitary confinement and torture. DCIP obtained information on 16 West Bank children arbitrarily detained by Palestinian security services other than the police in 2017, all except four at the hands of the Palestinian Preventive Security Service. In one of the cases DCIP documented, the Preventive Security Service held a 17-year-old from Nablus in solitary confinement for three days in September, interrupted by physically abusive interrogation sessions without the presence of a lawyer or family member. After an estimated 70 hours in detention at the Preventive Security headquarters in Nablus, the teenager was released. The Palestinian Authority is legally obligated to abide by the Convention on the Rights of the Child, which it ratified in 2014, and the Palestinian juvenile protection law passed in 2016. While signing these safeguards indicated progress in Palestinian Authority’s treatment of children, violations documented by DCIP in 2017 indicate gaps in fully aligning domestic juvenile legal framework and its implementation with international standards. The juvenile protection law was only implemented in the West Bank owing to the political division between the Hamas-led government in the Gaza Strip and the Palestinian Authority. Accordingly, Gazan children remain subject to the outdated British Juvenile Offenders Ordinance of 1938. DCIP documentation showed that children in conflict with the law in the Gaza Strip are also at severe risk of rights violations and ill-treatment, including torture, during detention. Based on six cases documented by DCIP in 2017, three children endured torture during police interrogations. A fourth child was reportedly physically abused by police station guards and adult prisoners with whom he was forced to share a cell, prompting the boy’s suicide attempt and resulting death on September 22. While the Gaza Strip began the year already entrenched in a humanitarian crisis, 2017 brought new threats to children’s human rights, especially at the peak of the electricity crisis. Political divisions between rival Palestinian factions Fatah and Hamas, along with taxation disputes, contributed to a serious degradation in children’s right to health, including clean water and medical care. The Fatah-led Palestinian Authority stopped payments for a portion of the Gaza Strip’s electricity supply, bringing electricity levels to an all time low. Electricity shortages decreased children’s access to basic and emergency care, also increasing wait times for specialized medical services and surgeries. Without power, children with illnesses and disabilities reliant on medical equipment struggled to charge and use their equipment. Around the same period, the Palestinian Authority pulled funding from the Gaza Strip’s already decimated health sector and local news outlets reported 30 to 70 percent cuts to Gazan civil servant salaries. During the course of 2017, both Israeli and Palestinian authorities prevented children from exiting Gaza for medical treatment by denying or delaying patients’ applications. DCIP documented 12 Palestinian children from the Gaza Strip who died as a result of inadequate access to health care, including poor hospital conditions, low availability of specialized treatments, or as a result of being delayed or denied treatment abroad. Of this number, nine were infants and eight were less than two weeks old. Six of the children who died received no response, were delayed, or denied medical referrals from the Ramallah-based Service Purchasing Unit (SPU), previously known as the Referral Abroad Department. Without this referral, patients cannot complete the process of applying for medical treatment outside of the Gaza Strip. Two children, age 4 and 17, died after Israeli authorities delayed permission for children to exit the Gaza Strip through the Israeli-controlled Erez crossing for medical treatment. Children’s right to health also suffered because of a marked decrease in the availability of clean water. Nearly one million children living in the Gaza Strip are facing an acute disaster around water and sanitation standards, according to the United Nations Children’s Fund. These deteriorating conditions took place against a backdrop of an already struggling health care system, caused in part by a decade of Israeli military blockade, joined by Egypt for much of that period, and repeated Israeli assaults. Israel launched airstrikes in the Gaza Strip on a near-daily basis during the last three weeks of 2017 and Palestinian armed groups fired rockets from the Gaza Strip during escalations following U.S. recognition of Jerusalem as Israel’s capital. Living with a long-term injury has been challenging for Thaer Joudeh, who also suffered the loss of family members during an #Israeli drone strike in 2014. When Defense for Children International – Palestine visited him, he said the experience has shaped his future plans. In a positive move for children’s rights in the Gaza Strip, government-run schools removed military-style drills from their Futuwwa, or youth, programs that focus on civics and health. A DCIP 2014 investigation found strong links between the school-based Futuwwa program and highly attended winter camps hosted by Palestinian armed groups, which took place off school premises. Following amendments to government school programs in 2017, neither the Futuwwa program nor the summer and winter camps appeared to constitute child recruitment under international standards. DCIP, however, remained deeply concerned at the potential of the program and the camps to serve as vehicles for future recruitment. DCIP in 2017 found no evidence that children in the Gaza Strip were being used or recruited by Palestinian armed groups for any role in armed conflict, in the context of these programs. However, pervasive poverty keeps children vulnerable to recruitment and other forms of child labor. DCIP lead efforts to support the first-ever bill in U.S. Congress focused on Palestinian human rights, specifically grave human rights violations against Palestinian child detainees. The bill, titled Promoting Human Rights by Ending Israeli Military Detention of Palestinian Children Act or H.R. 4391, prohibits U.S. financial assistance to Israel from being used to support the ill-treatment and torture of Palestinian children in military detention. The bill, which was introduced by Rep. Betty McCollum on November 14, had 19 co-sponsors by year’s end. The aim is to establish, as a minimum safeguard, a U.S. demand for basic due process rights for Palestinian children under Israeli military detention. This extends to an absolute prohibition against the torture and ill-treatment of detained minors, in keeping with both U.S. and international law. The bill falls in line with concerns long recorded by the U.S. Department of State. In March, for the 10th consecutive year, the annual report on Israel made note of the prevalence of ill-treatment toward Palestinian children and Israeli military courts’ denial of their fair trial rights.